This suggestion comes from a website called Quiltpiecer...the best things in life are quilted. 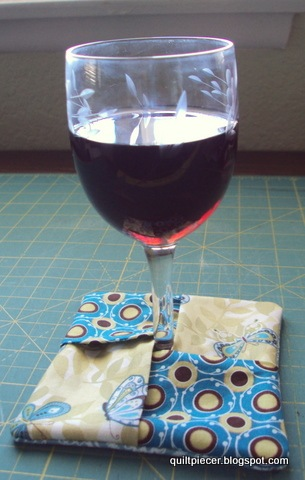 This is the intro from that site: These fold-and-turn coasters are SO easy and fun to make! I first saw this pattern in 2002 at a guild meeting, and the instructions were handwritten. There were no pictures … only hand drawings. Well, we’ve come a long way in 8 years! These coasters were made with five 5-inch cotton squares and one 5-inch flannel square. These can also be made in other sizes so long as the squares are equal-size. Suggested square sizes range from 4-1/2” to 6” … your choice. You may also use one 5-inch batting square, but I found batting was a tad too thick. But, again, your choice. Click HERE to go to the website for a full set of instructions.